Today’s blog post focuses, once again, on providing some healthy and delicious recipes for your and your guests this season! Toss tomatoes, mozzarella cheese, olive oil, basil, salt, and pepper together in a bowl until well coated. Skewer one tomato and one piece of mozzarella cheese on each toothpick. In a medium bowl, mix together the garlic, spinach, pepper and ricotta cheese until well blended. Set aside. Place strips of prosciutto into mini muffin cups so that they line the bottom, but there is some meat hanging out over the sides, and it kind of looks like a flower. Fill each cup with about 1 1/2 tablespoons of the cheese mixture, or so the cup is full and rounded on the top. The filling should look like the center of the flower. Combine all ingredients for Vinaigrette in a blender for 30-45 seconds OR in a bowl and whish. Set aside. Wash and prepare all vegetables and place in large bowl. Mix desired amount of vinaigrette to salad and serve. For the Love of Basil…. 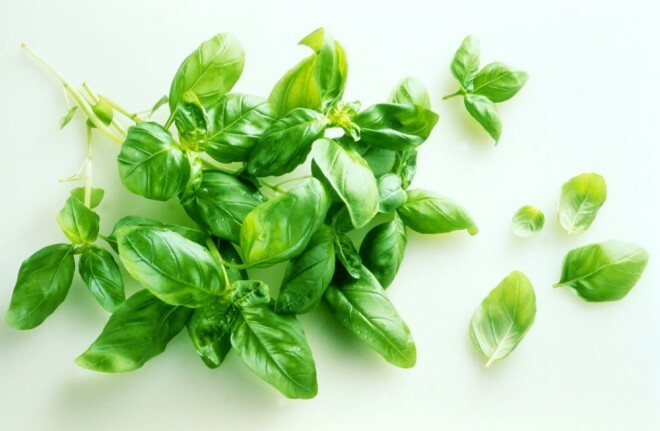 Here is a great article from Julie Daniluk and the health benefits of basil. Every year in the summer, my husband skips the flowers and brings home a bushel basket of basil from the farmers’ market for only $25. I’m always able to turn that gift into a freezer full of delicious homemade pesto. You see, while basil is native to Asia and Africa, it’s Italy that has instilled this herb into our hearts ever since pesto became one of the world’s most loved sauces. No surprise then that in Italy (and in my home! ), basil is a symbol of love. But I also love basil for a few other reasons: its intense aromatic oil scares pests away and ensures a good harvest, and it also happens to be an incredible guardian of your health, too! 1. Adding basil to your diet can help to protect you from bacteria, yeast and mold. Basil has strong anti-bacterial properties. This powerful plant contains several essential oils that have been found to exhibit antimicrobial activity against a wide range of bacteria such as listeria, staphylococcus and salmonella. These strains of bacteria are not only widespread, but are becoming resistant to treatment with antibiotic drugs. 2. Basil has strong anti-inflammatory properties. Basil not only provides healing benefits for people with inflammatory diseases such as arthritis and inflammatory bowel disease, but it also provides relief from the symptoms. The volatile oils in basil contain a compound called eugenol, which mimics the action of over-the-counter anti-inflammatory medications such as ibuprofen and acetaminophen. 3. Basil can protect your DNA from radiation and oxidative damage. Basil contains compounds called flavonoids. Two of these compounds, orientin and vicenin, have been studied extensively and results show that they protect the structure of cells as well as chromosomes from damage caused by radiation and oxidation. 4. Basil contains volatile essential oils that can help in the fight against acne. The volatile oils in found in basil have strong antimicrobial action that can help to fight the bacteria responsible for causing acne. 5. Basil oil’s eugenol also has anti-cancer properties. It is well documented that eugenol has a protective effect against melanoma, skin tumours, osteosarcoma and leukemia. 6. Basil can protect your heart and help to reduce blood pressure. The high levels of beta carotene in basil will be converted in the body to vitamin A. This vitamin provides strong antioxidant protection to the lining of the blood vessels and helps to prevent damage from free radicals. The high levels of magnesium in basil have been shown to relax blood vessels and improve blood flow. This recipe highlights the best of local produce. The tomatoes have a more concentrated flavour this year due to the dry weather and pair perfectly with fresh basil. Due to the acidity of the tomatoes, there’s no need for vinegar. Yellow cherry tomatoes are milder and easier on sensitive stomachs. 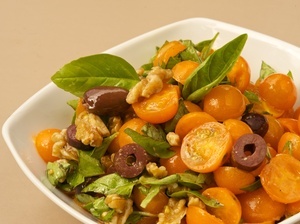 The omega-3 fat in the walnuts and the anti-inflammatory action of the olive oil make this salad wonderfully healing. This recipe can last a few days and is a huge family hit anytime. 1. Chop cherry tomatoes in half and add to a mixing bowl. 2. Season with olive oil and salt. 3. Chop basil into thin ribbons and sprinkle over tomatoes. 4. Add walnut pieces and chopped olives and gently toss all ingredients together in the bowl. Bushels of tomatoes are still available at a great deal of our local farmer’s markets. Why not pick up some tomatoes and make this delicious and nutritious salad? Have a super weekend!